The electorate has swung toward the Democrats and away from Donald Trump, but it might not be enough to give the party complete control of Congress. A 'house divided' appears to be what the United States is heading for in Tuesday's midterm elections, as the Democrats and Republicans look set to split control of the two chambers of Congress. The Democrats are poised to make significant gains in the House of Representatives and win most of the 435 seats up for grabs, while the Republicans are in a good position to retain control of the Senate. But while the Senate might be out of reach for the Democrats now, their performance there will still have a significant impact on their chances of winning complete control of Congress in 2020 — an election which (unlike this one) will feature U.S. President Donald Trump's name on the ballot. In order to win control of the House of Representatives, the Democrats need to make a net gain of 23 seats. That goal seems to be well within the Democrats' range, according to the way the polls are shaping up. The electoral map for the House is tough for the Democrats. This is in part due to demographic "sorting" — Democrats concentrating in cities, Republicans in rural and suburban areas — but also due to gerrymandering. In many U.S. states, the parties that control state legislatures get to draw the new electoral boundaries after each census of the population. The last redistricting took place following the U.S. census in 2010 — which turned out to be a very good election year for Republicans. The result was a map stacked against the Democrats. Without a lead of at least five points in the national popular vote, the Democrats are unlikely to win enough seats to give them control of the House. 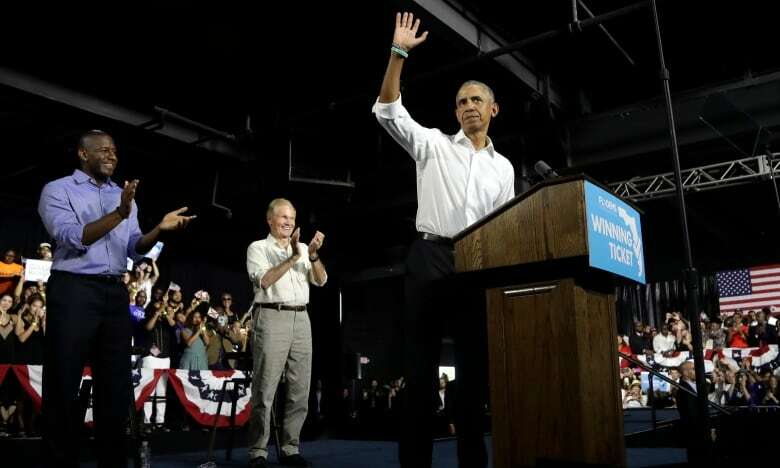 But polls suggest that the Democrats hold a lead of about seven to eight percentage points nationwide over the Republicans. Even the most pessimistic surveys give the Democrats an edge of at least five points, indicating that even in the worst-case scenario, the party might still be able to squeak by. But if you don't trust the polls (and after Trump's upset victory in 2016, a lot of Americans don't), you can turn to a number of other indicators that lean heavily in favour of the Democrats. The party has made significant gains in a series of special elections held since the presidential vote two years ago, most notably winning a Senate race in Alabama last year. And while that race featured unusual circumstances — the Republican, Roy Moore, faced multiple accusations of sexual misconduct — the Democrats repeated those gains in less controversial races. On average, the margin has swung by 18 points toward Democratic candidates in special House elections over the last two years. A swing of even half that size on Tuesday would easily award the party control of the chamber. The party also is outpacing the Republicans by a margin of two-to-one in fundraising, a discrepancy that has not been seen in recent history. 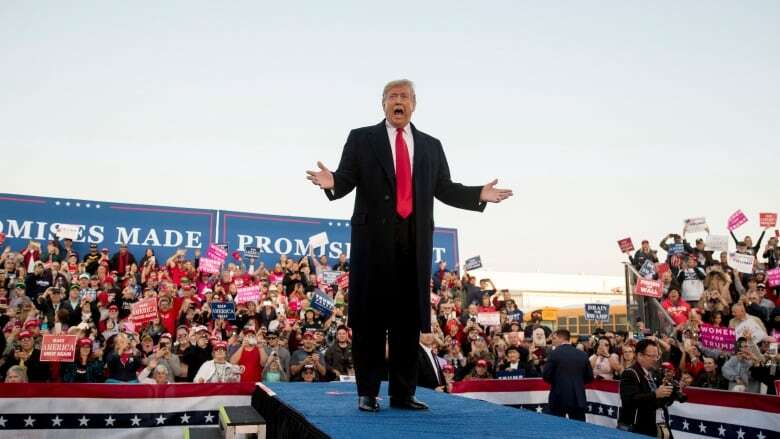 At 42 per cent, Trump's approval rating is worse than former president Barack Obama's was when his party suffered significant losses in the 2010 midterms. And the historical precedent looks bad for the Republicans. Since 1946, the party that controls the White House has lost an average of 25 seats in midterm elections. But while the signs look good for the Democrats in the House, the Senate is another story. 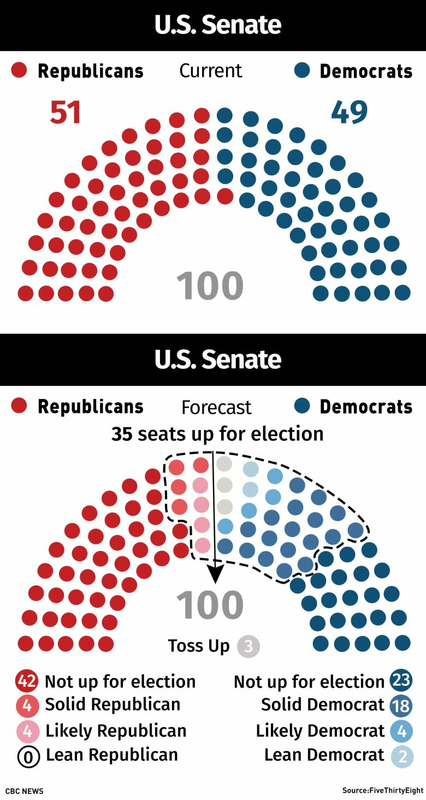 Every seat is up for grabs in the House, but only a third of those in the Senate are being contested for six-year terms. The Democrats need to make a net gain of two seats in order to take control of the Senate, but the field isn't very wide for them; they're already the incumbents in three-quarters of the seats at stake. Their two best shots of flipping Republican seats are in Arizona — where Kyrsten Sinema is narrowly ahead of Republican Martha McSally — and Nevada, where Jacky Rosen is neck-and-neck in the polls with Republican incumbent Dean Heller. Other seats they could win are harder to find. The party trails by at least four points in every other Republican seat, with those in Tennessee and Texas — where fundraising star Beto O'Rourke is up against Ted Cruz — offering the Democrats' best hopes for an upset. Looking only at Republican seats, the odds don't look so bad for the Democrats. But that assumes that the party can hold the seats it already has. That appears unlikely. Democratic incumbent Heidi Heitkamp trails Kevin Cramer, her Republican challenger, by about nine points in North Dakota. The party is also in tight races in Missouri and Indiana, states which Trump won by a margin of 19 points over Hillary Clinton in 2016. Florida is a toss-up. So a lot needs to go right for the Democrats if they're to take control of the Senate. They have to hold all of their Trump-state Senate seats and win two (or three, if Heitkamp is defeated) from the Republicans. They might not be able to pull that off. But that doesn't mean the results in the Senate won't be worth watching. Because only one-third of the Senate is contested every two years, the results of one election can have a significant impact on future votes. If the Democrats can't win control of the Senate this year, they might be able to manage it in 2020. But that still would require the Democrats to perform reasonably well on Tuesday. If the 51-49 Republican edge in the Senate holds, the Democrats would still have a path to a majority with victories in Colorado and North Carolina in 2020. If the party can't repeat its 2017 upset in Alabama in 2020, it could instead defeat unpopular Republican senators in Kansas or Kentucky, reverse a close 2014 Republican victory in Alaska or flip traditionally-blue Maine. The Democrats, in other words, will have more options in two years than they do now. In fact, if the Democrats can make a net gain of just one seat in this cycle, a majority in 2020 becomes all the easier. If they suffer a net loss of one seat, however, taking the Senate in 2020 could be just as tough for the Democrats as it looks to be this year. That would force them to wait until 2022, when the map will be much more favourable — but the political environment could be more unpredictable. And 'unpredictable' is a pretty good word to describe the last few years in U.S. politics. The country could still be in store for another surprise on Tuesday. The Republicans might beat their polls again, or the Democrats — surging on a wave of enthusiasm hinted at in fundraising and special elections — could win an even bigger victory than the polls suggest. That would put control of both houses of Congress into Democratic hands — and the fate of Donald Trump's presidency as well. Radio special starts at 8 p.m. ET on CBC Radio One hosted by Susan Bonner and Michael Enright. America Votes, a special edition of The National, starts at 8 p.m. ET on CBC News Network, live streamed online. Heather Hiscox starts the day at 5 a.m. ET on CBC News Network the morning after the elections with results, analysis and more.